charming bungalow for 2 people, private spa and sea view. Bungalow furnished and decorated in Creole colors, comfortable, with a chamber a bathroom and a fully equipped indoor kitchen e.
Its large terrace is equipped with sitting area, dining area and lounge area with its private spa. This cottage has a magnificent view of the sea and the surrounding countryside. Ideal for holidays in all intimate and relaxing. Beautiful bungalows on 5000 sqm of tropical garden with sea view. 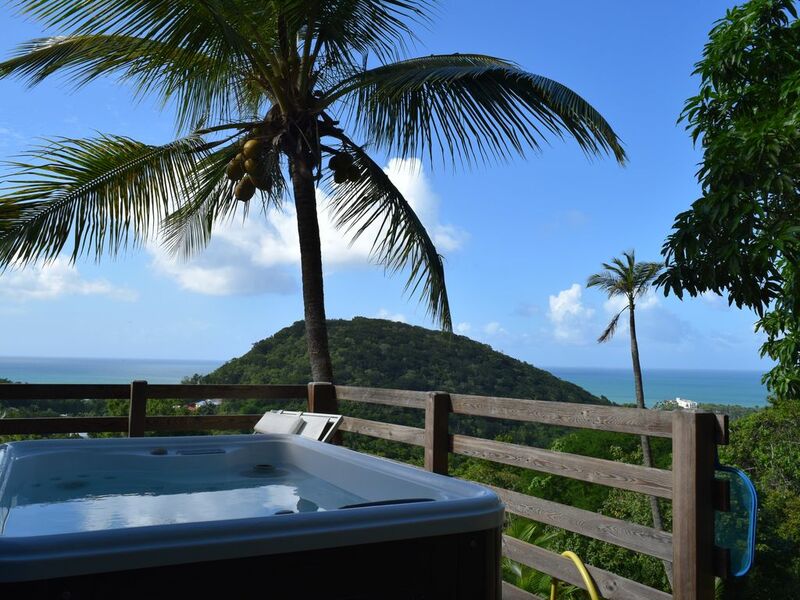 Rentals are located in the countryside, on top of a hill surplombrant the Caribbean Sea. Accommodation, quiet, very well located, close to beaches and shops, direct access from the main road 2, without the drawbacks. No overlooked, unless the nature and heavenly view of the sea. The bungalows are independent, allow privacy. Warm welcome by the owners on site. Local shops: 500 m, open even on Sundays. Tarif pour 2 personnes pour logement AZUR. Lit supplémentaire : 10 euros par jour.